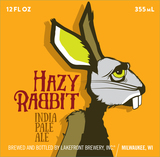 Hazy Rabbit pours a bleary yellow-gold topped with a white, mousse-like head. Soaking up the goodness from Mosaic, Idaho 7, Denali and Azacca hops added to the fermenter, Hazy Rabbit delivers sweet papaya, ruby-red grapefruit and lush pineapple aromas. A healthy dose of flaked oats in the mash add a mild sweetness and a smooth mouthfeel. Heaps of late-boil Idaho 7, Mosaic, and Citra hop additions saturate every juicy swig with over-ripe citrus and tropical fruit flavors.